» (U//FOUO) According to DHS reporting, between 28 January and 3 March 2013, the public safety answering point for a south-central region sheriff’s office received a call demanding repayment of a loan for an unknown individual. A TDoS attack followed this request, disrupting the non-emergency business lines. » (U) The US Coast Guard (USCG) in late May 2013 reported that an individual called a USCG cutter claiming to have a legal matter to discuss with a crewmember. The subsequent TDoS attack flooded the ship’s telephone network with several rounds of TDoS phone calls, completely disrupting phone service. 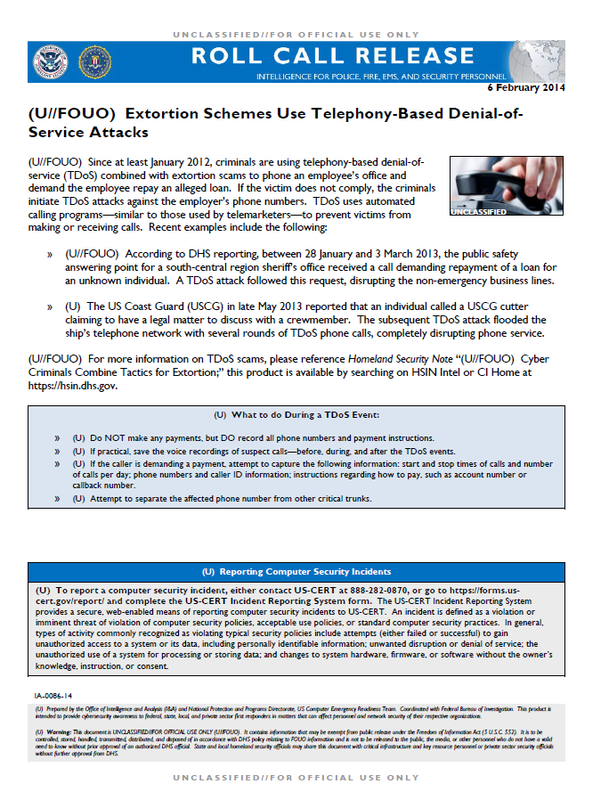 (U//FOUO) For more information on TDoS scams, please reference Homeland Security Note “(U//FOUO) Cyber Criminals Combine Tactics for Extortion;” this product is available by searching on HSIN Intel or CI Home at https://hsin.dhs.gov. » (U) Do NOT make any payments, but DO record all phone numbers and payment instructions. » (U) If practical, save the voice recordings of suspect calls—before, during, and after the TDoS events. » (U) If the caller is demanding a payment, attempt to capture the following information: start and stop times of calls and number of calls per day; phone numbers and caller ID information; instructions regarding how to pay, such as account number or callback number. » (U) Attempt to separate the affected phone number from other critical trunks.